This guest review is done by my good friend, Rachel. I've written about her a few times before. She and I go back to my bookstore days. She was one of the employees I supervised. Aside from not being a morning person and habitually arriving five minutes late, she was a peach for an employee! I pretended to be all professional and did not pursue a friendship but alas, we hit it off splendidly and couldn't resist hanging out with her outside of work. Now, being the busy bees that we are, we gather together at least once a month at our favorite Japanese noodle shop. Her with the Soba and me with the Udon. I, for some reason, STILL get them mixed up. She is super sassy and smart and addicted to all things crafty. I see her one day owning a farm and while on breaks in her barn, see her sitting surrounded by chickens wearing knee high mud boots and a crocheted hat on her head. Though she may prefer craftiness to reading most days, she does have quite a bit of good book taste. When I was approached to review this book, I thought of her right away. A bit on the cyncial and feisty side, Rachel and Christopher Moore fit like two peas in a pod. Here she is folks. 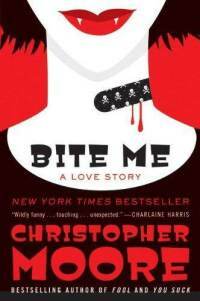 Rachel, my Guest Reviewer of Bite Me by Christopher Moore. Nothing is sacred in Christopher Moore's novels. Nothing is irredeemable either. The duality between raw, goofy, biting and at times juvenile humor, and the sweetness and heroics of his characters always makes for a smart, entertaining read. His characters are at the same time grating and endearing; but always funny. I was introduced to Moore through his Christmas release, The Stupidest Angel; A Heartwarming Tale of Christmas Terror. In truth, I was sold on the title alone as anyone who has ever done so can attest that working retail during Christmas makes a person fairly cynical about the holiday. Needless to say, I loved it. I mean really, what isn't there to love about Christmas and Zombies? Since then I have read very nearly all Mr. Moore's books, and have become a devoted fan. When the RHBC asked me to review Bite Me, I was thrilled! Bite me is the third installment of Christopher Moore's vampire series. Fans of the Twilight or Anne Rice variety vampire will be sorely disappointed, I am afraid. However, fans of the show True Blood, or of Charlaine Harris' Sookie Stackhouse books will find some common ground with Moore in this series. Also, readers of Pratchett, Gaiman, Vonnegut and Douglas Adams will appreciate the zany antics, absurdity and sarcasm of Moore. Quite possibly also readers of the Pride and Prejudice and Zombies, etc. books. This story begins in the San Francisco Bay Area. A hoard of vampire cats is roaming the city. Vampire minions Countess Abigail Von Normal, backup emergency mistress to the Greater San Francisco Bay Area, her boyfriend and scientist Foo Dog, and her pathetically gothic best friend Jared attempt to contain the outbreak. Unfortunately, the two vampires that can help the minions have been encased in bronze. Well, to be more accurate, the minions encased them in bronze in the previous book, and they are pretty sure that the vamps will be pretty pissed off, and hungry when released. Also fighting the vampire cat hoard are The Animals, a group of night-shift grocery store working vampire hunters,The Emperor of San Francisco, a homeless gentleman with his trusty dog companions, detectives Cavuto and Rivera, who have recently become aware of the supernatural ongoings of the Bay area, and a mysterious elderly Japanese gentleman with a sword in day glow orange socks. Hilarity ensues as all the groups of "hunters" with differing motives engage the vampirism outbreak in their own way. This was a refreshing break from "serious" vampire novels, and vampire romances. Highly recommended for those who appreciate irreverence. Wow. Doesn't she write an awesomely wicked review? Thanks for stopping by and sharing with us your thoughts! Stop on by and check her out at her blog above. Christopher Moore is the best! Fantastic Review Rachel! I picked this one up for my son's GF; I just love the titles of Moore's books. She had never read any of his stuff before that but she's sure reading him now! I love the title of the book! :) The book sounds like fun. Thanks for the review! fantastic review!!! off to check Rachel's site now!